Clive Palmer has announced that he is seeking $1.2 billion in damages from John Park, his colleagues and FTI Consulting in relation to their administration of Queensland Nickel earlier this year. Mr Palmer said causes of action would include aiding and abetting a breach of trust and causing serious breaches of the Queensland Nickel Joint Venture Agreement by Queensland Nickel. “Park has opposed the appointment of a special purpose liquidator by the Commonwealth to cover up his wrong doing and has sought to convince the creditors’ committee of Queensland Nickel Pty Ltd (QN) to oppose it,” Mr Palmer said. “John Park has done this for one purpose only and that is to hide his criminal actions and diversion of joint venture funding from a new liquidator. Mr Palmer said the special purpose liquidator should commence proceedings against Mr Park to recover the worker entitlements caused by his closing down of the refinery and sacking the workforce in breach of the Queensland Nickel Joint Venture Agreement. He said the refinery would still be operating if Mr Park hadn’t sacked everyone. “It was John Park who caused an unlawful breach of trust and contract disregarding the lawful rights of joint ventures to close the refinery and dismiss the workforce causing social upheaval to fill his own pockets,’’ Mr Palmer said. 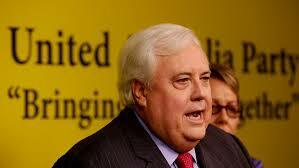 Mr Palmer said Mr Park and FTI have a “serious conflict of interest”. “He should resign as liquidator of Queensland Nickel Pty Ltd in favour of the Commonwealth Government nominated liquidator,” he said. The news follows a report from the administrators of Queensland Nickel, which suggested Clive Palmer could be held liable as a “shadow” director. Administrators state in the report Queensland Nickel became insolvent on November 29 and remained that way until their appointment in January this year. Sacked staff are owed A$73.9 million while unsecured creditors are owed A$151.2 million and party related creditors A$546 million. Palmer has strenuously denied he was a director in the company, although he has admitted to being part of a committee that approved expenditures. He has also admitted to the use of email alias when communicating with the company, but denied it was used to disguise his involvement with Queensland Nickel. In January, 237 workers were made redundant. At the time, the company has blamed low nickel prices for its decision to cut staff, and also blamed the Queensland Government for knocking back its request to guarantee a multi-billion-dollar loan.